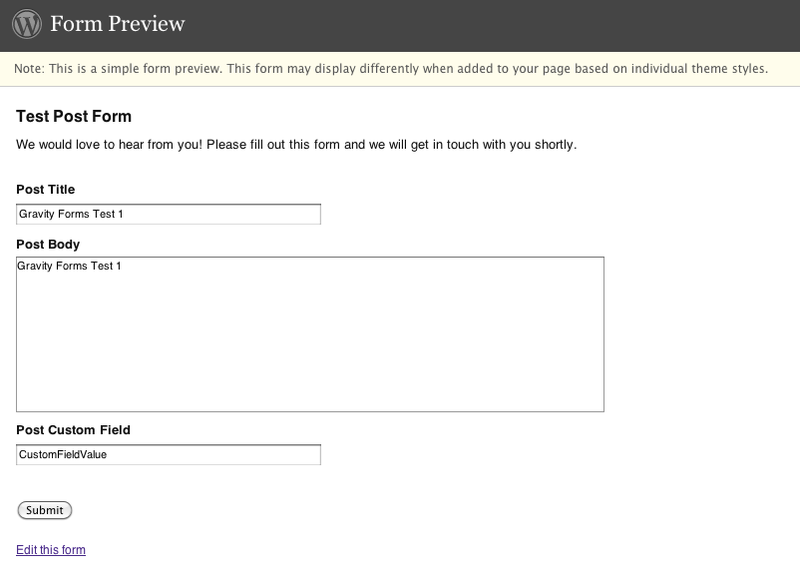 im using post fields in my form for user submitted testimonials, what i notice about my problem is, when i set a content template for my title, the value for my custom field on the form is not being pass into the custom field on the "custom posts". when i REMOVE the content template for my title, the value for my custom field on the form is BEING pass into the custom field on the "custom posts". it saves the value..
Now is my form or the plugin that has an issue? How are you creating a custom post type? Are you using custom code or a 3rd party plugin to do this? i think there is no problem with the custom post types, but im using custom post types ui, the issue is when there is a content template for the post field TITLE, the value for custom posts is not being saved, but when i remove the content template, the value is being saved. 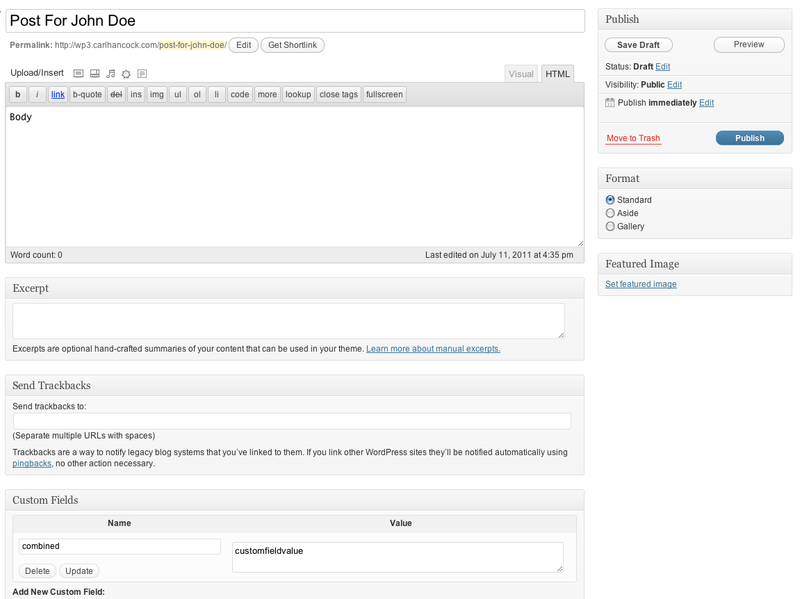 Custom Post Type UI allows you to add custom post types to your site. But Gravity Forms by default doesn't create custom post types, it only creates WordPress Posts. So what method are you using to tell Gravity Forms to create a custom post type? Are you using custom code or another plugin such as the Gravity Forms Custom Post Type Add-On? 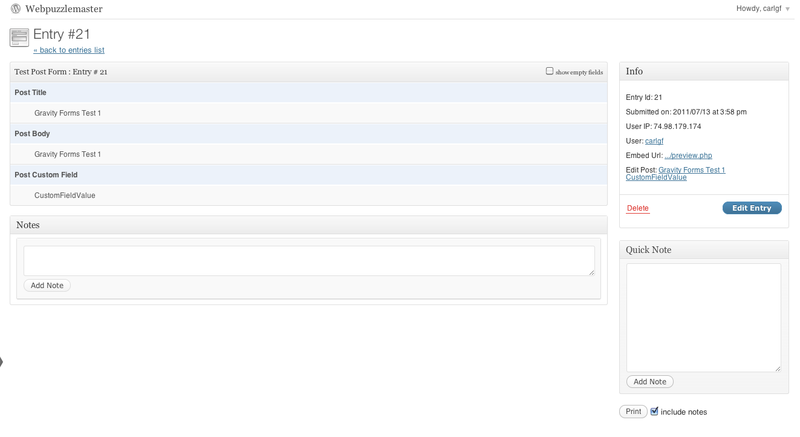 The Gravity Forms + Custom Post Types add-on is a 3rd party add-on. You would have to discuss this with the developer of that Add-On as it sounds like it could be a bug related to how it creates the custom post type. There is a support forum for that plugin on WordPress.org, go to the page for that plugin on WordPress.org and there should be a link for it. I'm unable to reproduce this locally in a variety of configurations which means it looks like it's how you are configuring the fields. 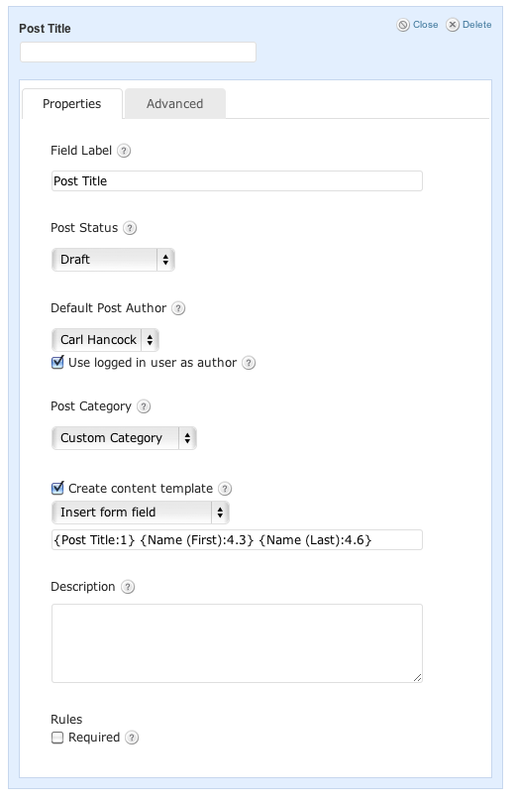 Notice that the Content Template worked fine, I added the value of a Name field to the Post Title as part of the Title and the Custom Field stored correctly also. If you haven't configured the Custom Field Name for your Custom Field the value won't be stored as a Custom Field, it has to have Name. So that would be the first thing I would look at with your Custom Field. I think I configure the custom field name.. because, if I don't use content template, the custom field value is being saved. I'm using Verve Meta Boxes to define custom fields for different post types, maybe its the issue? Verve Meta Boxes has nothing to do with Gravity Forms creating the post data. However, if you don't use the correct Custom Field Name that Verve Meta Boxes is using then your custom field data may not populate the Verve Meta Boxes properly. You would have to know the actual custom field key that Verve Meta Boxes is using for each field, which may not be readily apparent. I'm not familiar with Verve. I'm using the correct Custom Field Name.. what do you mean by "custom field key"
answer this first: Why is the custom field value is being save if I'm not using "content template"
Without being able to see your form and see you how you have it setup, I can't answer that question. 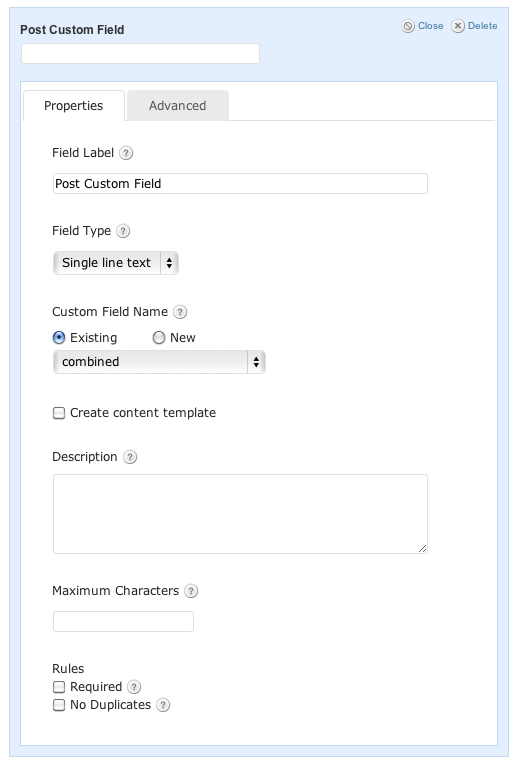 I'm able to create custom fields just fine with or without a content template configured for any of my Post Fields, so the functionality works but I can't take into account how you have configured everything. If you send me a WordPress admin login for the site having the problem along with a full explanation of what form, which field, which custom field, etc. I can take a look. You can send it to carl@rocketgenius.com. I created a Test Form on your site called Test Post Form and configured it to create a post utilizing both a content template on the Post Title as well as incorporating a Custom Field. Everything worked as expected. You can recreate what i've done by previewing the Test Post Form I created and then submitting your own test and seeing the Post that it creates afterwards. You'll see in the post that the Post Title used our Content Template to include the value of our custom field that is on the form, which I submitted a value of "CustomFieldValue". You'll also see that Custom Field listed in the Custom Field UI in that screenshot using the Name of "customfieldname" and a value of "CustomFieldValue" exactly as it is configured to do. So custom fields are being created properly by Gravity Forms, with or without the content template. I was able to recreate the issue you reported with the Testimonial form. Because it is being created using the 3rd party Gravity Forms Custom Post Type Add-On the issue is most likely related to the use of that Add-On, because that is the difference between your form and the test form I created that is working fine. I know a lot of users use that plugin and I haven't seen anyone else report this issue, so i'm not sure if it's a bug with the version of the Custom Post Type Add-On you are using or some sort of conflict. But it's specific to using that Add-On. 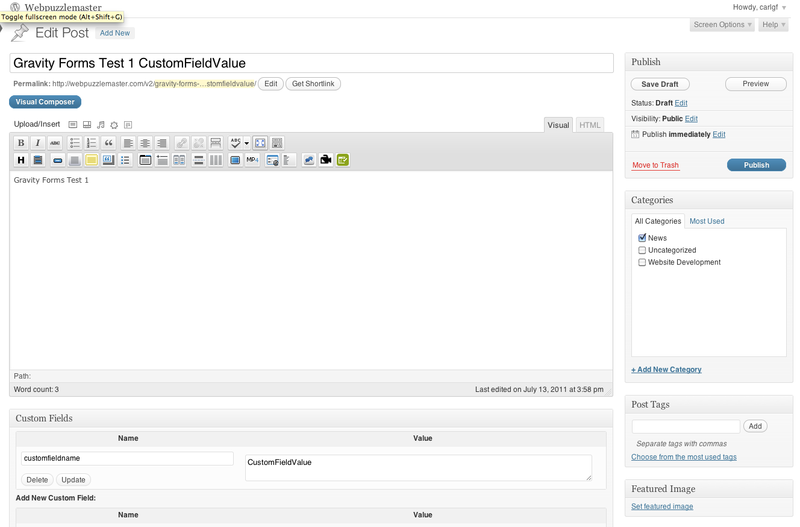 You are going to need to get in touch with the developer of the Gravity Forms Custom Post Type Add-On. Get in touch with him and explain that custom fields aren't being saved when you implement a content template on the Post Title field. It's probably a bug related to how he's creating the custom post type information.